Vegetarians avert your eyes, look away now, this is all about meat. Well, meat and “collagen”, a polite term for some other bits people prefer not to think about. I know that this post is a bit different to my usual recipe trials, so I promise that it will be followed very soon by a delicious new dish! Plus if you get to the end of this you will thank me, or maybe not, sometimes it’s better not to know. To brighten this bleak tale I will finish by telling you how to make your own mince so you know what you’re getting. Mislabelling – When lamb is beef is pork is turkey. Not long after arriving in the UK I was sent an article about some food standards testing that was conducted in Yorkshire. A huge range of products were tested and the results were a bit horrifying. Whilst no horse was found (unlike previous testing), the amount of mis-labelling or misleading statements was up around 30%. The biggest complaint was cheaper meat being passed off as something more expensive, for example beef labelled as lamb etc. This is very very easy to do with mince and I’m sure it probably happens all over the world. I don’t know about you but I prefer to get what I’ve paid for. I’ve always hated the amount of fat and water that comes out of store-bought mince (and bacon for that matter). My husband bought a packet home a little while ago and it was 20% fat. You can of course buy lean mince, but even then when you cook it an appalling amount of water comes out. I used to think that I was imagining it, but google “water in meat”, I dare you. It explains why some meat is next to impossible to brown and instead stews in its own juices. Water in itself, whilst a rip-off, bears no harm. It’s everything else that can accompany the added water that concerns me, salt, oils and “water-binding additives”. This practice isn’t confined to mince they do this to regular cuts of meat too, particularly frozen ones, check the ingredients. I’ll admit that mince is usually pretty cheap to buy, so if you ignore the issue of paying for lamb when you may be getting beef, there isn’t a huge saving to be made by making your own. But, if you compare the cost per kg of buying premium lean mince with a nice rump roast you may be pleasantly surprised. Especially if you consider that you might also be paying for water and collagen. Whenever I’m in the supermarket I also keep an eye out for ‘almost out of date’ discounts on meat joints. I bring them home and quickly turn them into portions of mince to put in the freezer. I probably end up paying about the same price for my mince, but it’s better. This one got added to my list just yesterday. I was at the grocery store with plans to make some gluten-free gnocchi (post to come) with Bolognese sauce. I was looking for some beef when I thought oh stuff it, I’ll just buy mince today. I picked up a packet of lean mince and was looking for the fat content when I noticed the ingredient label. “100% Beef”, excellent. But underneath some fine print caught my eye, it said ratio of meat to collagen no greater than 12%. Collagen?? Was the cow getting fillers? Turns out collagen is another word for connective tissue, mostly tendons, ligaments and skin (plus corneas, cartilage and bone). The ‘meat’ content is bulked up with all that great stuff. GOOD GRIEF WHAT SHOULD WE DO?? Easy. Make your own. It takes a little getting used to but it’s really very easy. The trick is not to whizz it for too long or you end up with meat puree. 1. Cut meat into cubes, removing any bits of ‘collagen’ and excess fat. 2.1 Red Meat/Pork – Fire up whizzy machine to Speed 6 and, working quickly, drop cubes of meat onto the running blades one at a time, stopping a couple of seconds after you’ve dropped in the last piece. Only process a good handful of at a time, then empty the mince out and keep going. 2.2 Chicken/Fish – Put chicken cubes into the bowl, maximum of about 500 gm at a time. Press turbo a few times until desired consistency is reached. Making mince this way effectively strips out any remaining pieces of sinew and connective tissue. You’ll discover it wrapped around the blade separated from the meat. Better cuts of meat will work more easily. Eg rump makes a beautiful mince. You can use cheaper cuts but you may find that you need to increase the speed to 8 as they have more sinew etc spread through out the meat. It needs the faster speed to separate it out. Otherwise you get beef tinsel, with small strips of beef attached along the length of the sinew. 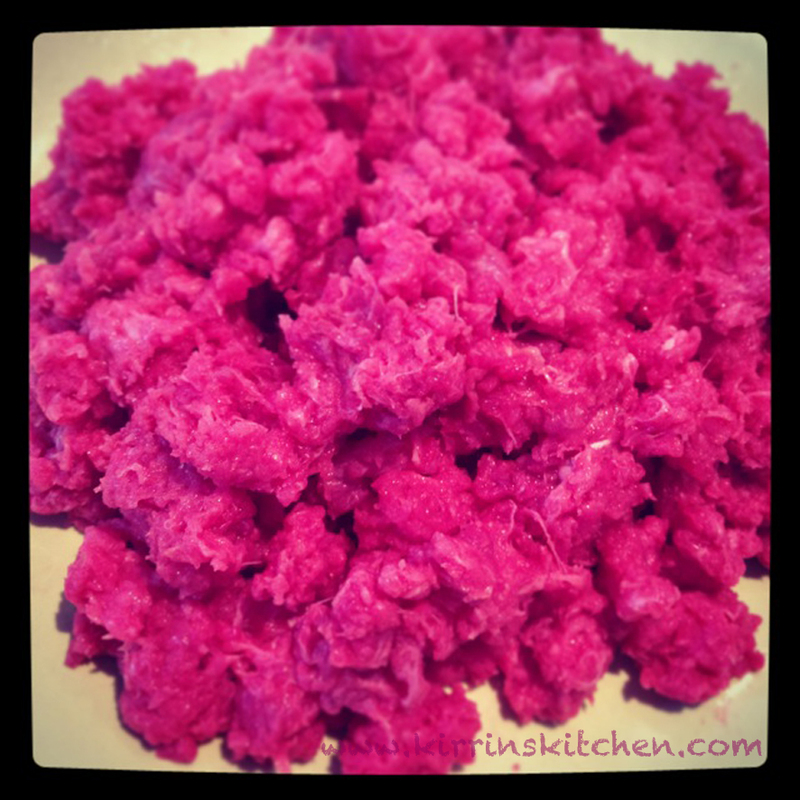 Don’t over process, meat puree is not a good look unless your cooking for a baby. Especially when mincing fish for fish cakes, fish can become really elastic and chewy if over-processed. Sometimes there is benefit to ‘under’ processing. Shredding lamb, rather than mincing makes a delicious spiced lamb pizza topping. if you’re cooking straight away you don’t even need to clean the bowl! So there you have it. Happy mincing. It is strangely satisfying and you get to feel all virtuous having made your entire meal from scratch. 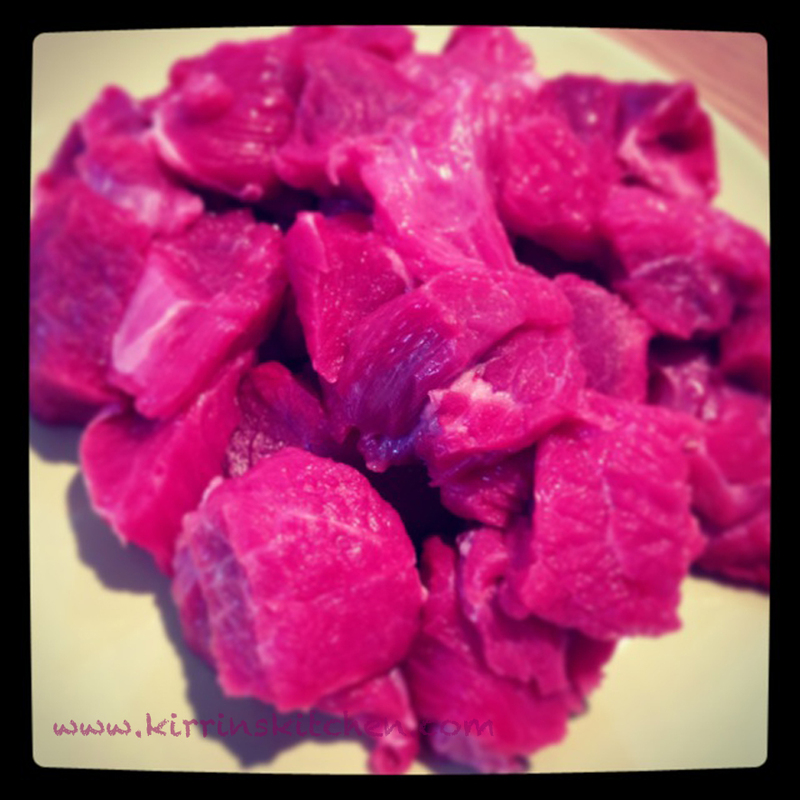 This entry was posted in How To & Quick Tips, Kirrin's Kitchen, Mains and tagged Beef, Chicken, Collagen, cuts of meat, Lamb, Mince, Thermomix, Water. Bookmark the permalink.